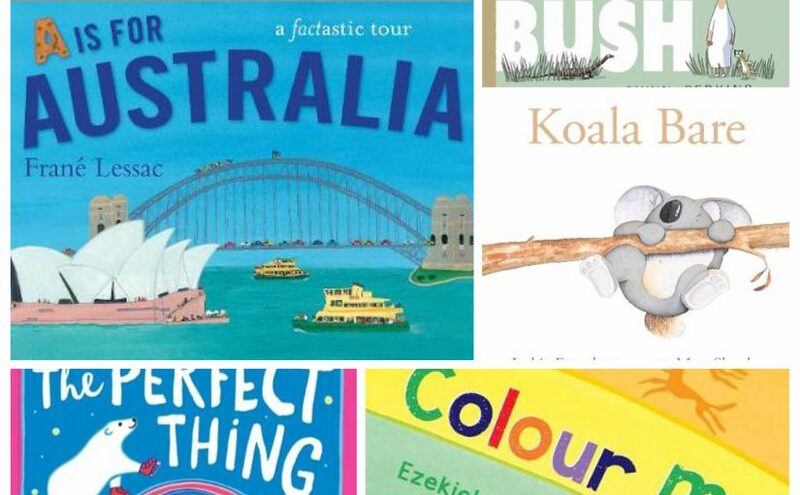 Paying acknowledgement to our ‘great southern land’ today on Australia Day with a few true blue Aussie picture books, their dinky-di characters and beaut landscapes. There is a lot to love about this unique nation. What does Australia mean to you? 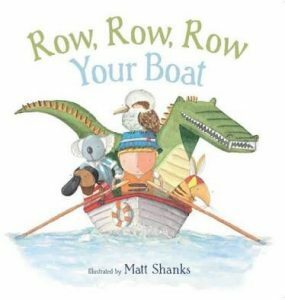 Row, Row, Row Your Boat, Scholastic Australia (text), Matt Shanks (illus. ), Scholastic Australia, 2016. Putting a spin on the old classic nursery rhyme, with the gorgeous integration of some of our favourite wildlife animals, is the Aussie version of ‘Row, Row, Row Your Boat’. Charmly illustrated by Matthew Shanks, this short and sweet story takes its enthusiastic preschool readers on a river ride adventure full of excitement and surprise. Life is certainly a dream rowing your boat gently down the serene, native-laced stream. With each stroke, we are greeted by another animal doing their characteristically natural thing in their landscape. 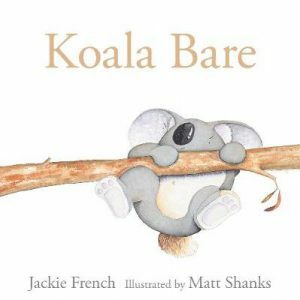 A sleeping koala, a squeaking bandicoot, a sword-wielding piratey platypus, and a laughing kookaburra all feature in the fun rhyme. But it is the entertaining illustrations that really tell the story. Look out for the inconspicuous crocodile throughout, as well as the funny story taking place in (and out of) the boat! Row, Row, Row Your Boat is an endearing and energetic Aussie-flavoured book that will have its audience captured from start to finish, over and over again. Don’t Call Me Bear, Aaron Blabey (author, illus. 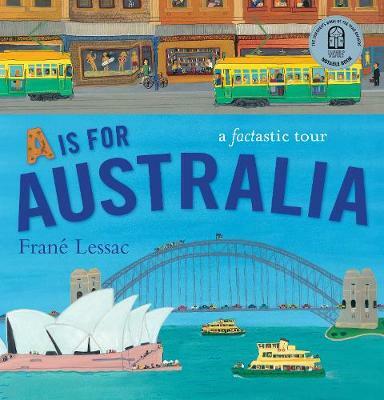 ), Scholastic Australia, 2016. Here’s a little piece of Australiana that us locals all know about…right?! For poor Warren, it seems like a serious case of mistaken identity. You see, Warren is a koala, not a ‘bear’, and he goes to every length to justify himself. 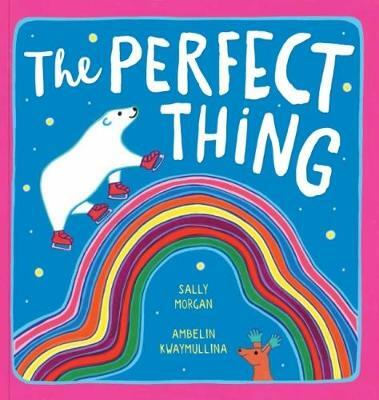 True to the authentic Blabey-style, here is a sarcastic and cringe-worthy yet surreptitiously loveable rhyming tale that is full of energy and laugh-out-loud moments. Warren explains how it all started with the stupidity of Captain Cook and his pioneers claiming to have found a ‘bear’, but in fact, he is a member of the common marsupial family (see the very scientific chart). Actual bears from around the globe are examined, and when Warren thinks he’s finally broken through, it is his own Aussie counterparts who still don’t quite ‘get it’. 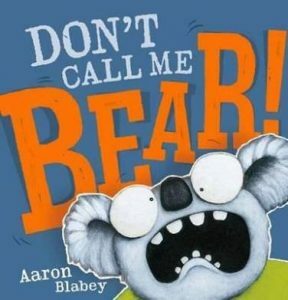 Don’t Call Me Bear is a colourful book of a colourful character, and through its quirkiness and craziness, could be a great opener for studies on history of The First Fleet and the biology of Australian animals. ‘Bear-iffic’ for children from age four. Why is that Emu Wearing One Red Shoe?, John Field (author and lyrics), David Legge (illus. ), Scholastic Australia, 2016. 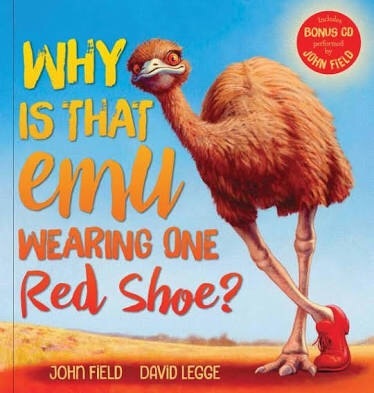 Written and performed on the bonus CD by John Field, and with digitally mastered illustrations by David Legge is the farcical performance of an emu on a mission; Why is that Emu Wearing One Red Shoe?. Listening to the music certainly makes for a lively experience, but reading the story aloud is just as exuberant. With each rollicking verse, another group of creatures join the parade as they follow and wonder “why was that emu wearing one red shoe?”. Soon enough the media become involved, and after a bustling train ride and some questionable speculations, the answer is finally disclosed, and it’s really not as complicated as made out in this huge hullabaloo. The textural and life-like quality of the mixed media illustrations perfectly suit the energy and movement of the fast pace and the feel that this is a live, broadcast event. Why is that Emu Wearing One Red Shoe is an action-packed comedy that will have preschoolers hopping and bouncing and jiving from head to shoe. 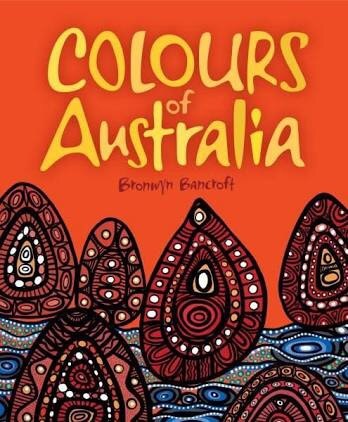 Colours of Australia, Bronwyn Bancroft (author, illus. ), Little Hare Books, 2016. Colouring our sensory world with all the shades of the rainbow is the beautifully transcendening Colours of Australia. Bronwyn Bancroft, member of the Bundjalung Nation, spoils us with her outstanding talents as she leads us through a bright, texturally and lyrically entrancing venture across the land. From white diamonds spilling across the sky, to an explosion of red sunrise and vivid dances, orange ochre shapes protruding from ancient foundations, orbs of sun light and green velvet cloaks of hills, and finally, blue fingers of sky drawing the day to an indigo close. Bancroft brilliantly incorporates the beauty of trademark landscapes and features of Australia’s stunning earth, with her equally poetic-style narrative and mesmerising Indigenous-quality illustrations, that all literally dance off the pages. Colours of Australia; wonderfully whimsical and evocative to connect readers with our astonishing country, and to reinforce sustainability and the highest respect to the Aboriginal people and their culture. See Dimity‘s lists of great Australian books here and here. Posted on January 26, 2017 Author Romi SharpCategories Book Reviews - Childrens and Young Adult, New Book Releases, Romi SharpTags #ByAustralianBuyAustralian, aaron blabey, Aboriginal, Australia Day, Bronwyn Bancroft, Colours of Australia, David Legge, Don't Call Me Bear, Hardie Grant Egmont, indigenous, John Field, Little Hare Books, Matthew Shanks, Row Row Row Your Boat, Scholastic Australia, Why is that Emu Wearing One Red Shoe? Two enchanting books in a series written by Aboriginal elder, Aunty Ruth Hegarty and playfully illustrated by Sandi Harrold are about Aussie animals on Aussie adventures. 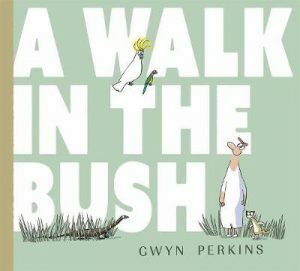 ‘The Creatures of Dryden Gully’ and ‘Pip and Pim’ take their readers on journeys of self exploration and discovery, with the tendency to veer off track slightly as young children often do. But their delightful characters and moralistic storylines remind us all of which path to follow. 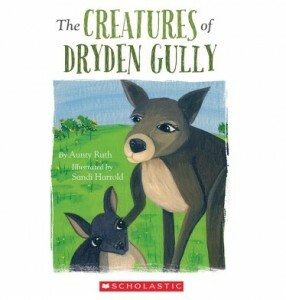 The Creatures of Dryden Gully is a special story of a mother’s protection and unconditional love as a young Kangaroo Joey discovers what it means to be unique and proud. 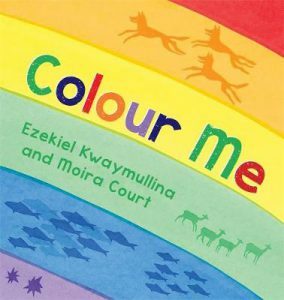 Author and storyteller Aunty Ruth Hegarty, a child of the Gunggari Nation and the Stolen Generation, tells a heartwarming tale of Joey who is eager to grow up. When the Royal visitors, the deer, arrive to their land, the Natives are nothing but intrigued by their beautiful characteristics and abilities. In a bid to stretch his legs and explore his surroundings, Joey secretly follows the Royals to a clearing. But when poachers make a sudden, alarming appearance, Joey is confused and frightened. Luckily the young roo remembers his mother’s earlier lesson in survival and the pair are lovingly reunited. 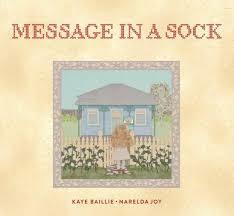 With earthy-coloured oils on canvas, the illustrations are endearing and reflective of the pureness of the story. The Creatures of Dryden Gully reminds us of the importance of listening to our elders and recognising our own special qualities. It also reinforces awareness of folklore and concepts native to Australia. For children from age four. Written and illustrated by the same collaborative pair, Pip and Pim comparably appeals to its audience with a similar important message, sweet demeanor and playful images. It’s virtuous storyline is told tenderly yet colourfully, with dedicated text pages that oppose the illustrations. Eager little possums, Pip and Pim, can’t wait to explore the forest floor for the first time. The liveliness of the bush under the bright moonlight, the call of the cicadas and the song of the night bird all add to the excitement of their first out-of-tree adventure. But despite their parents’ warnings to be careful, the young ringtails pay no attention. Initially they find other creatures such as echidnas and bandicoots busily foraging in the darkness. Then, upon stumbling into a plover bird’s nest, the screeching father frightens them and they quickly scamper off to find their awaiting parents. 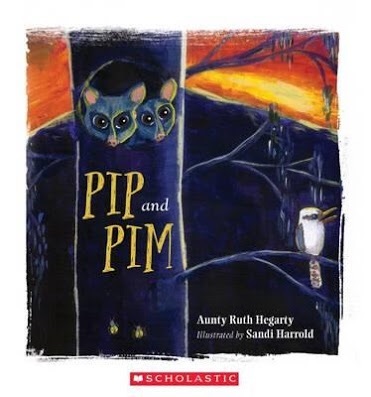 With Harrold‘s spirited, bold illustrations showing off the glowing flora and fauna amongst the authentic nighttime hues, Pip and Pim is a delightful and charming book to share with your loved ones. A story of trust, listening to elders and a bit of mischief, it is an effective way for preschoolers to learn important life lessons about parental guidance and ‘stranger danger’ with an Australiana flavour. Jared Thomas, thanks for talking to Boomerang Books. 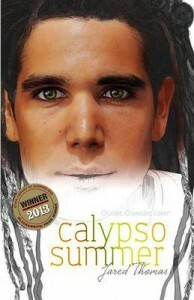 Calypso Summer (Magabala Books) gave me a break-through insight into a young Aboriginal man. Calypso is a brilliant character. He tries so hard to make his life, and the lives of those around him, work, but it’s tough. Could you tell us about him and his cousin, Run? 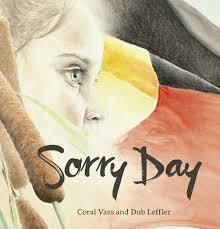 Calypso and Run are young Aboriginal men trying to exist in a difficult world. Their interaction with each other, family members and others is framed by a history of dispossession, racism and discrimination that has contributed to some of the lowest levels of education, highest levels of unemployment, and poorest health conditions amongst any Australian people. Having money and getting work plays heavily on both Calypso and Run. However, while Run is defeated and takes drugs and does petty crime to survive, Calypso attempts to change his life in order to obtain personal goals. What is the importance of family, tradition and country to someone like Calypso? Calypso’s love for family and his understanding of tradition and country provide him with a greater sense of purpose, a strength that enables him to cope better with challenges. It helps him to put things into perspective. What is your background and why have you written Calypso Summer? My father’s family is Nukunu and Ngadjuri from the Southern Flinders Ranges and Scottish, and my Mum’s Aboriginal family is from Winton, Queensland and her European family are Irish. I wrote Calypso Summer because I want to raise awareness of how racism has and continues to impact on the lives of Aboriginal people and to show the positives that can occur if the right types of opportunities are available. Cricket is the backdrop to your novel but I watched the movie Australian Rules, based on the novels Deadly, Unna? and Nukkin Ya by Phillip Gwynne not long before reading Calypso Summer. You do mention the game of Australian Rules briefly in your novel. If you’ve seen the movie or read these novels, would you recommend them? Phillip Gwynne’s Deadly Unna is a useful text in communicating the futility of racism, also providing important explorations of sexism and domestic violence. 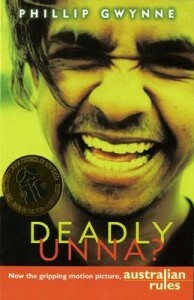 Media relating to the release of Australian Rules, the film adaptation of Deadly Unna reveals much controversy as the story is based on the murder of two young Aboriginal men and consent wasn’t requested from the relatives of these men when writing the story. The controversy prompted Screen Australia, then the Australian Film Commission, to employ Terri Janke to write a position paper for working with Indigenous content and communities. This formed the basis of Screen Australia’s Pathways & Protocols, a filmmaker’s guide to working with Indigenous people. 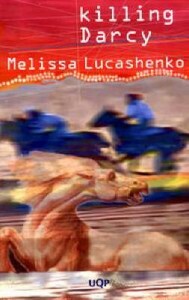 I’d recommend Deadly Unna and Australian Rules to be read and viewed by students in association with an introduction to protocols for representing Aboriginal people in various media. If Phillip Gwynne had consulted with Aboriginal people in the writing of Deadly Unna and Australian Rules, they would be much more celebrated works. Are there other relevant books you would prefer to recommend? 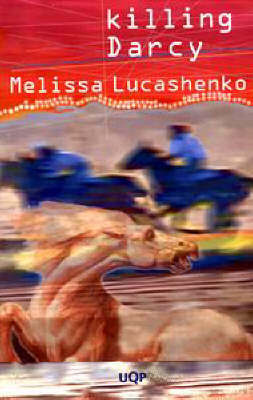 I would prefer to recommend Melissa Lucashenko’s young adult works such as Steam Pigs, Killing Darcy and Hard Yards. Who have you written Calypso Summer for – young adults, adults or both? I have written Calypso Summer for young adults but know that it also appeals to adults. What do you hope for young men and women like Calypso? I hope that young men and women like Calypso come to the realisation that in a society where Aboriginal people make up an outrageous proportion of the prison population, that being educated, healthy and employed, preferably within or contributing to our own communities is the most rebellious act that one can do. My young adult novel ‘Sweet Guy’ is published by IAD Press and my children’s novella ‘Dallas Davis the Scientist and the City Kids,’ is published by Oxford University Press. ‘Songs that Sound like Blood,’ will be released by Magabala Books in mid 2015. I’ve also published academic articles, articles, short stories and poetry in various anthologies. My first major work was a play called ‘Flash Red Ford,’ which was produced in Kenya and Uganda in 1999.